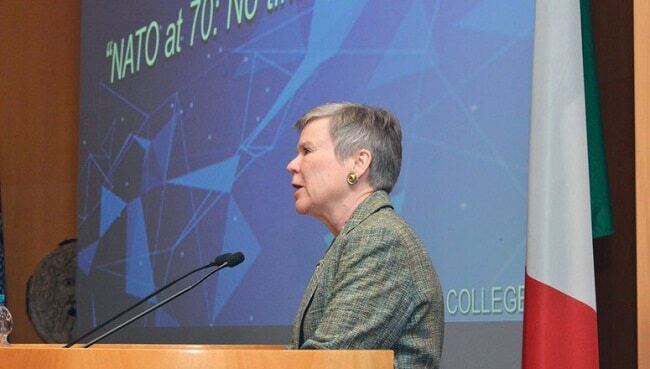 “NATO Foreign Ministers gathered in Washington last week to mark the 70th anniversary of our Alliance and celebrate seventy years of peace and prosperity,” Ms. Gottemoeller said. “We’ve grown in size since 1949 – from 12 to soon 30 Allies. […] Spreading the area of peace and stability and enriching our Alliance with new voices, new experiences, and new capabilities; we have certainly modernized – with more women contributing in and out of uniform, as well as diverse nationalities and skillsets; and we’ve got a younger workforce today than the Alliance had when it was born; about 22% of civilian staff at NATO HQ are under 40, developing leadership for the future,” she added. The NATO Deputy Secretary General also highlighted what lies ahead for NATO. “We are in a period of great power competition and the very values that underpin our liberal world order – freedom, democracy, the rule of law – are under strain. Tough task, but at seventy, NATO is in good shape. It remains the world’s most powerful military alliance and an anchor of stability in turbulent waters. It will steer us through this new, more tense and uncertain environment,” she pointed out. The Deputy Secretary General illustrated some of the main efforts already being carried out by NATO. “We are strengthening our presence in the Baltic and the Black Sea regions; we are increasing the readiness of our forces and our resilience against hybrid and cyber threats; we are training, assisting and advising the Afghan forces to ensure the country never again becomes a safe haven for terrorists and we are also doing everything we can to create the conditions for peace; we are training and advising Iraqi security forces to ensure that ISIS can never return; and we are building the capacity of partners – Tunisia, Jordan – to fight terrorism”.